There’s a text piece by writer J.M. 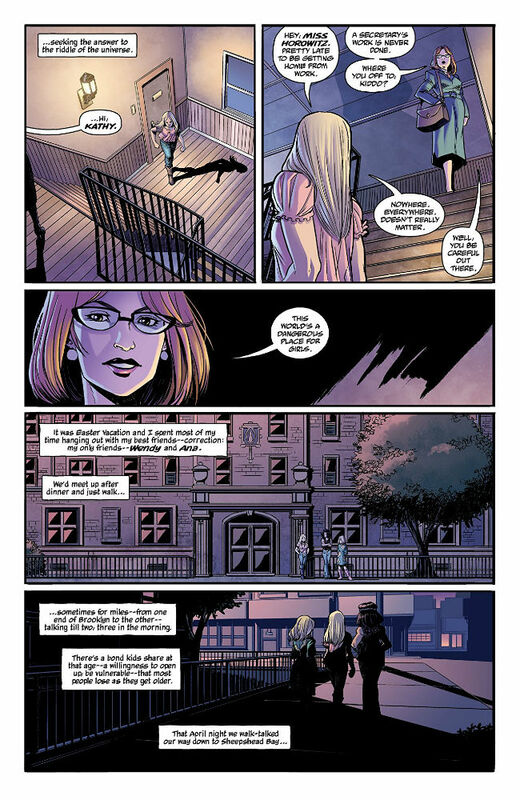 DeMatteis at the end of the first issue of The Girl in the Bay – the latest book from the acclaimed Dark Horse Comics/Berger Books line – where he talks about his relationship with the tales he presents. Fascinatingly, DeMatteis describes the creative process in terms of stories being as much separate entities that choose their tellers as they are acts of crafted imagination. If you’re a long-time follower of DeMatteis’s writing, of course, you’ll already be aware of that seam of thoughtful, reflective and quietly powerful spirituality that runs through his work. I’ve been reading his comics for the best part of four decades now and the manner in which he invites his audience to revel in the pure joy of the art of storytelling remains unparalleled. 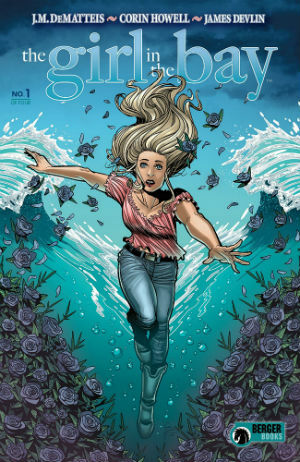 The Girl in the Bay sees DeMatteis reunited with editor Karen Berger for the first time since the early days of Vertigo Comics for a four-issue collaboration with artist Corin Howell, colourist James Devlin and letterer Clem Robins. Initially set in 1969, this first part recounts the pivotal moment in the life of teenage rebel Kathy Sartori when her life is eerily changed forever. Violently attacked after a night out and thrown into Brooklyn’s Sheepshead Bay, Kathy makes her way back to the surface only to find herself catapulted forward in time 50 years to the present day. In a world that has passed her by she needs not just to come to terms with what has happened to her but also solve the mystery of the stranger who has been living her life in her place. 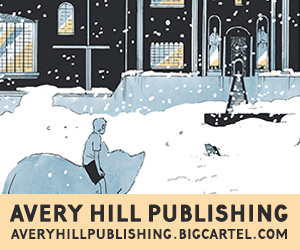 Reviewing the first part of a serial comics limited series is perhaps a strange exercise in that rather than analysing a narrative we’re instead evaluating the effectiveness of an opening chapter. 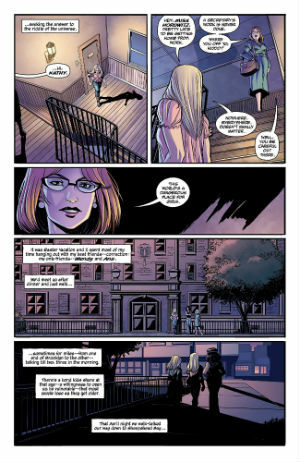 When we selected The Girl in the Bay as our ‘Comic of the Week‘ earlier this week at Broken Frontier I described it as “a masterclass in establishing premise, characters and setting.” In a limited page count DeMatteis sets up a gripping mystery, ensures our empathy with (and investment in) a flawed but very human central character, and places both in an environment that is constant but shifting, recognisable but ethereal. And, just to defy expectations, at the very moment when the reader thinks they have a grip on where the story is going it suddenly veers off into another direction entirely with a wonderfully devious twist. This is, of course, a team effort and Corin Howell’s visuals are stunning throughout, dexterously contrasting the elements of the everyday and the supernatural that converge in this opening instalment. Her visual characterisation is very strong too, taking us into the mindsets of the cast and subtly telling us as much about their emotions and motivations as DeMatteis’s narration and dialogue does. 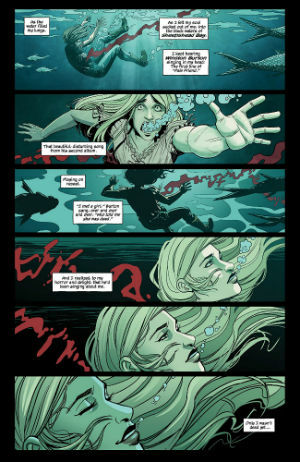 Panel-to-panel storytelling is especially notable here in regards to the dramatic effect of the passage of time, whether that be in the ferocity of a sudden brutal act of violence in one of the key scenes of the issue or Kathy’s helpless, slow descent into the depths of the bay as her life ebbs away from her on multiple levels. James Devlin’s colours accentuate the moodier, more atmospheric scenes of the issue and manage to root it in both the conflicting realms of the familiar and the otherworldly, while Clem Robins’s lettering plays a vital role in communicating some of the poignant beats of the story by intermittently reflecting Kathy’s fragile emotional state as her sense of disconnection and displacement grows in the final pages. 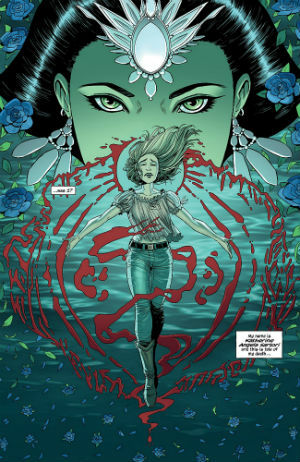 While we’ll need to wait a further three issues to discover whether the pay-off matches the set-up there’s no doubting the strength of this debut issue as an opening chapter. 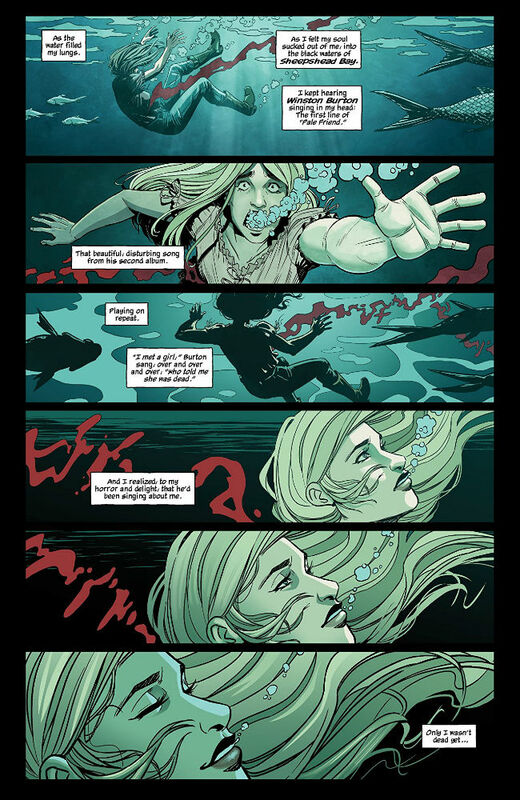 Haunting, captivating and unforgettable, The Girl in the Bay is the work of a creative team in perfect synch.